In Sunday Worship, we'll continue to explore Jesus' 40 day fast in the wilderness. The theme this Sunday is trusting God while in the wilderness, and our focus verse is Matthew 4:8-11. In our Carbon Fast and Daily Devotion, we are "fasting" from unsustainable transportation this week. Next week, we will focus on sustainable eating. Catch up on past devotions here, and sign up to get our daily emails anytime here. In our Sunday Conversations (10:10am downstairs), we're continuing our series on Lenten devotional practices rooted in wilderness Scripture. This Sunday, we will learn about the practice of lectio divina from Deacon Abby Ferjak. And come be part of our midweek Lent Bible Study! We will continue our exploration of the Israelites 40 years in the wilderness at 6pm Mondays in Spanish, and 7pm Wednesdays in English. Come join us. 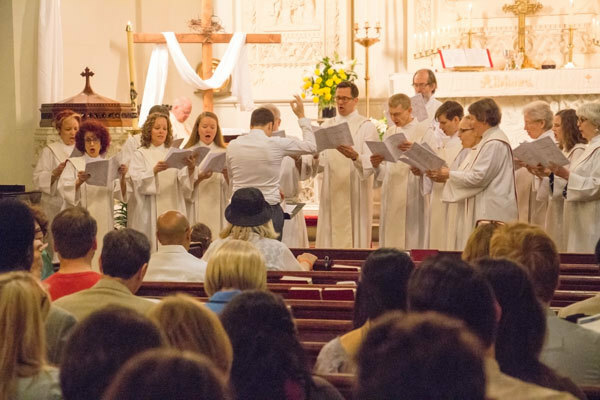 Interested in singing with our Advent Chorale? Want to join in time for Easter morning? You can! Come to rehearsal on Thursday, March 22, at 7:30pm and then on Easter morning at 10:10am. The Chorale will be doing a simpler anthem by Handel that will be lively and fun to sing (with organ and trumpet), so it's a comfortable and fun way to start if you are interested in joining. 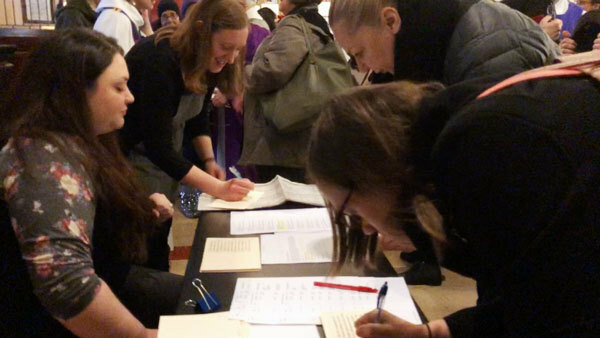 This past Sunday, members of our congregation wrote to congressional representatives calling for gun control legislation. Advocacy work puts faith in action as we stand with our sisters and brothers here in the United States and around the world. Interested in taking the next step? Call your Senators and Representatives and ask them to protect the most vulnerable in our society from gun violence. Click here and enter your zip code to find your representatives and click here to find contact information for Senators Gillibrand and Schumer. An Easter Lily is a wonderful way to celebrate God's creation while honoring or remembering loved ones or an occasion. Lilies are $20 each. They are potted plants, so each has several flowers. If you would like to give an Easter Lily in honor/memory of a person or occasion, you can do so on our website. The Advent Prayer Ministry is comprised of members and friends of our congregation who are committed to lifting up in prayer the concerns, challenges, hopes, and thanks of any and all who request it. Prayer requests come to the ministry via email or telephone, through the Advent website, and also through personal contacts. 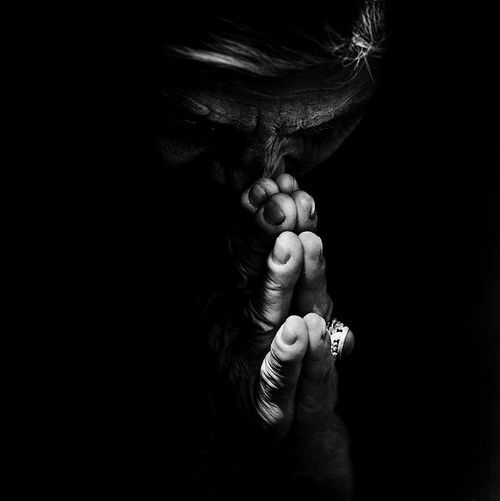 Prayer requests are shared through email and are kept confidential among ministry members. If you would like to be part of this important ministry or have a prayer request, please contact Kathleen Carpenter at kathc89@gmail.com or by calling 212-362-2338. For this ministry, we give thanks. 2018 ELCA World Hunger Domestic Hunger Grant! Did you know we have a magazine? And, it's actually really good. Lutheran Magazine is an awesome monthly resource with devotions, news, stories, and more from pastors and ministries throughout the Evangelical Lutheran Church in America and partners around the world. Through our congregational subscription, you're able to get Lutheran Magazine sent right to your home each month for free as a member of our congregation. If you aren't currently getting it and would like to, let us know. Adult Conversation | "Lectio Divina." Led by Deacon Abby Ferjak. Meets at 10:10am in the basement fellowship hall. Advent Poetry Reading | Meets after 11am worship in the hall. Bring your own poems, a poem you love, or simply enjoy the readings!